Next Post Spurts and plateaus or a slow and steady climb? Hi Arash, I just read your new mesage as it just popped up. I know how much you love bike riding and how this has been so much a part of your life, so I’m really struck with the FES bike riding that you’re doing. It’s really amazing. I can feel your tired muscles that you describe. I’m sending continuing love, support and Blessings to you, my remarkble friend. Great news, stay positive as always. That FES bike sounds fantastic. I like the sound of the tingling you feel after a ‘ride’. That’s great news. (By the way, are you able to get any lower leg massages to promote circulation)? Love that! So happy that some of your rehab can be an activity that you enjoy (as much as that is even possible) and so good for muscle memory and recovery! So very happy for you! It’s amazing how muscles can “remember” like that! Great to hear you’re doing this. Good for you! What joy it must be to “fee” worn out! Awesome! Keep up the great work Arash! Arash, I read all the time your blog on wordspress. I admire your courage and strongness and straight hold on to recovery. Don’t you ever stop doing so. I believe in you. One day, you will be on that bike of you again!!!! God bless you, i love you . It is so important to keep the muscles,tendons and ligaments strong while you are on your way to recovery. Vince. That is so amazing! Maybe you can watch a movie of biking outdoors like a simulator that would also help? Keep working! Isn’t there some way to bypass the spinal chord injury? 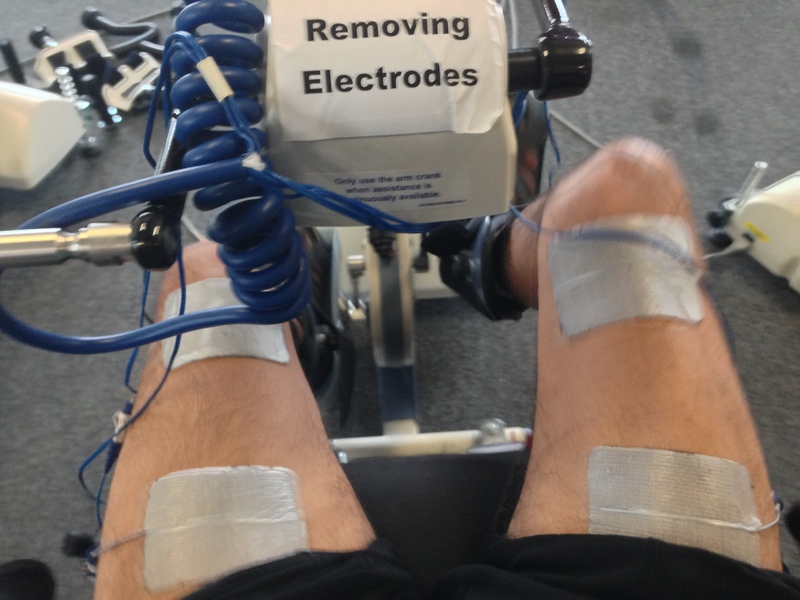 If those electrodes from got your legs to move you’d think they could connect your upper spine to below your injury somehow. Oh wow Arash ~ so happy i popped over to check on you. I somehow missed this in my reader – -and I’m sooo excited for you to have another tool to simulate this beloved sport both in imagery – and now also through this muscular impetus of the electrodes. Wow – you could feel the soreness in muscle after too? That is pretty amazing ~ keep us posted on your progress here — I wonder if you will start noticing muscle definition changes soon ~ I loved to bike too ~ one day!! Hi Arash. I’ve been meaning to contact you for a while now. “What?” You’re probably thinking. “I don’t even know you!” Haha. I know. My friend Michael Housewright over at “The Blissful Adventurer” told me about you. A few weeks back, I checked out your site and was overwhelmed by your story and your courage and determination. I am in awe. You sound like the coolest guy ever and I am so impressed by you. Anyway, friend, I too love to bike. I started riding after my accident, in fact, because walking was difficult with an arm that only wanted to dangle by my side. I’m glad you’re able to use cycling in your recovery! If you’d ever like to talk, you can find me on my blog or at jesscywriter@hotmail.com. I’m rooting for you and will be following your blog! Hi again! Thank you so much for the reply. It is wonderful to be in contact with you, too. Again, I am so inspired reading your story. I hope riding the FES bike continues to help! If you want to start at the beginning of my story, the link to the first part is right here: http://jesscy.com/2013/01/26/how-to-not-die-the-fall/… And, please, don’t think I’m trying to self-promote. That’s not what this is about at all. (I can’t stand it when bloggers do that, actually.) I just wanted to tell you a little about what happened to me. Be encouraged! People all over are cheering for you!!! I truly hope that this helps you get back on your feet and back on your bike real soon. I know it’s a long, slow, arduous path you have to take, but it is sounding promising. Are you able to move more than just your toe now? How is everything progressing? Oh fantastic! That is encouraging. 🙂 Are you wiggling your toe every chance you get now? I truly hope that you get more movement soon. It’s a very slow process but I can tell you have determination and stamina and will get there!!!!! I’ve been extremely busy with college, but I had some time to check out how you’re doing. So glad to see you on a RT300! I love them. I ride every other day for 1 hour. Have you used the arm bike yet?